Pot magnets are strong magnets that are developed for the current industrial needs. 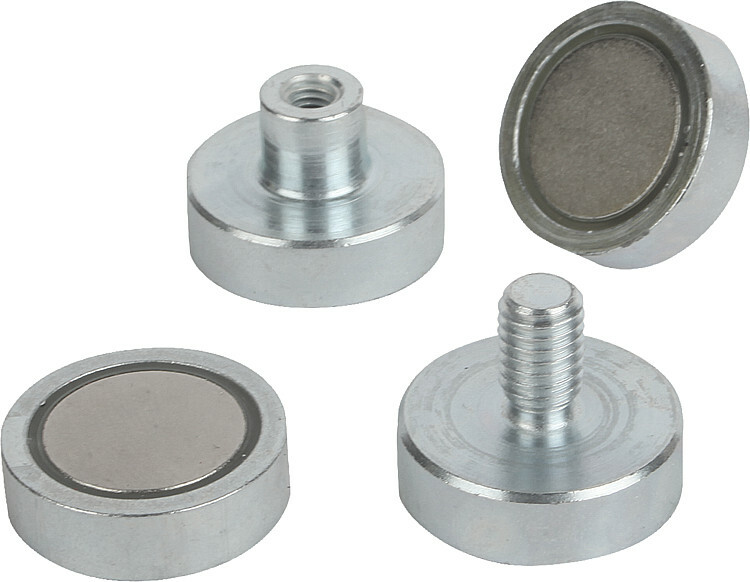 They are made up of magnets like NdFeB, SmCo, AlNiCo, hard ferrite, plastic, rubber and other components. These magnets can produce a magnetic field on its exclusive surface. 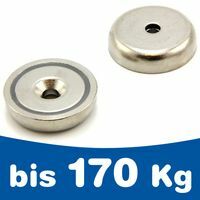 Depending on the usage, pot magnets are of different size, shape and width. Different types of pot magnets functions in different temperature. However they give same result in the normal temperature. 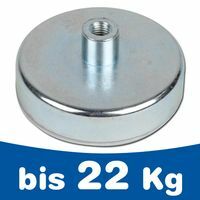 Pot magnets, also known as holding discs, are generally used for gripping, clamping and fixing components together. Defined by a central void, some threaded, others countersunk, this cavity allows for attachment to non-magnetic surfaces via a screw, rivet or bolt. Pot magnets are clung onto the walls or ceilings of shipping containers on work sites, utility spaces or inside trucks with a hook or eyelet screwed into the void as hanging point for equipment. Pot magnets are designed for clamping directly onto a steel surface; they are made from a large magnet encased within a steel shell. They are magnetic on one face only, creating a solid clamping force. However, they should not be used to attract other magnets or attract through a gap as they have a shallow depth of magnetic field. Pot magnets have many advantages and can be supplied with a tapped hole, a countersunk hole, a counter-bored hole, a threaded stud or a threaded collar all for convenient mounting. 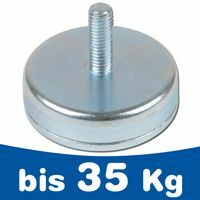 They can also be supplied with hooks and eyebolt attachments, ideal for hanging a variety of items. 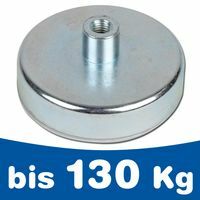 A pot magnets circular shape fits snugly into rotary voids created in materials requiring permanent fastening with the capacity to release for service or cleaning. On workbenches as clamping agents, pot magnets hold and release on demand, products like white goods as they undergo assembly or service. Pot Magnet / Magnetic lenses are characterized by a specific magnetic circuit arrangement, providing thus maximum magnetic force utilization. Their application range includes metalworking plants and/or mechanical engineering plants, in combination with various preparations, tools and devices. We offer Pot Magnets in a silver (chrome, zinc or nickel) finish, a white paint finish, a red paint finish, black rubber coated finish and ferritic stainless steel finish. Our Pot Magnets can be used in a variety of applications. For example they can be used in extremely cold applications (in theory towards absolute zero) and in extremely hot conditions (up to +300 degrees C, perhaps up to +350 deg C). All the Pot Magnet types can be used for ambient temperature indoor applications where moisture content is low or negligible. NdFeB Pot Magnets are best for maximum pull strength with a small size. Ferrite Pot Magnets can be used for corrosion resistance, marine, low cost and higher temperature applications. Alnico Pot Magnets can be used in higher temperature applications and where the pull force needs to change as little as possible with temperature variation. 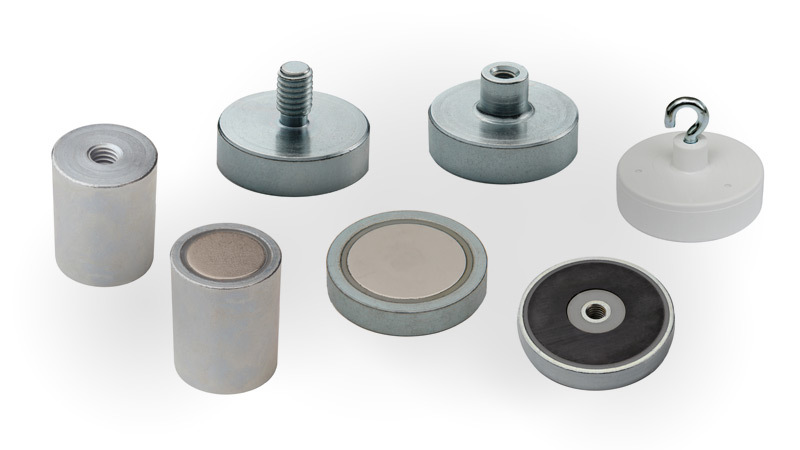 Alnico Pot Magnets can also be used in corrosion resistance applications. SmCo Pot Magnets can be used for extreme temperature applications and marine / corrosion resistance applications. These magnets have only one surface of magnetic attraction. This type of construction prevents further spread of magnetic field. Due to this, other items or machine parts in the vicinity of the pot magnets do not become magnetized. These magnets have ability to retain their magnetic force indefinitely. The magnetic force of these magnets are only affected by the increased temperature and external magnetic force. How does a pot magnet differ to a regular magnet? Magnetism is confined to one face only, where it is concentrated to give the maximum holding force possible for the size of the magnet. They are more resistant to chipping and cracking as they are protected by their steel shell. The permanent pot magnets must not be exposed to radioactive radiations for longer duration as it might effect their magnetic strength. This can work within permissible temperature. If these magnets are used beyond permissible temperature limit it might again affect their magnetic strength. Who supplies high quality Supermagnets, Pot Magnets? Magnosphere offers best priced Pot magnets globally to all industries, including Automotive, Aerospace, Military, Advertising, Design House, Electronic and Academic/R&D. Please inquire for custom Neodymium magnets or magnetic assembly. Buy Pot Magnets at Magnosphere and get a better deal!